Hike through the trails of the low forest, discover virgin cenotes and unique caves alongside a monkey or two, the occasional snake, and (if you’re lucky) wild felines. All this in San Manuel, Tizimín. To get to San Manuel from Mérida, you’ll spend about two and a half hours on the highway, where you can admire the distinct landscapes, allowing you to understand Yucatán on a deeper level. Views of pastures and tropical vegetation surround the highway in a part of the state that is primarily dedicated to cattle farming. Be very aware when driving; wildlife (like foxes and badgers) and cattle are frequently spotted crossing the highway. When you get to Tizimín, follow the road headed toward Colonia Yucatán and take the turn to Popolnah until you arrive to San Manuel (Km 11). When you get to San Manuel (km 11), visit the “Museo Comunitario” (Monday to Friday, 10 am – 1 pm and 3 pm – 6:30 pm). The museum was inaugurated in October 2017, and here you’ll find incredible archaeological artifacts, like the “chocolatera,” a vessel used to drink chocolate, and “vertederas,” the vessels used for carrying water found inside the cenote. Many of the pieces found were related to production and consumption of cacao, a substance that had a large significance in the ancient Maya culture. Research done by National Geographic and INAH led to the discovery of a human skull in a ceremonial context, considered the oldest human remains found on the peninsula. Researchers believe that this area was attractive because of its various water sources (cenotes), and the place served as a checkpoint for travelers, where they left ritualistic offerings dedicated to the underworld. At the museum, speak with Lizbeth Chí, who can tell you about the history of the various explorations led in San Manuel. She tells the history of the fist discovery and the global team of researchers who excavated underneath the deep waters of the cenote, finding more than eight pieces completely intact. They continue studying these artifacts today. As well, next to the cenote where they extracted the pieces, you’ll find a small chapel, typical to the region, with a wooden cross on the door. Visit it and observe simple beauty. The adventure continues in the Maya forest of this region, but you have to go with a guide who knows the trails, and who can take you to explore unimaginable natural treasures. In my case, I was lucky enough to go with Alejandro and Erika Cupul, a father and daughter team of eco-touristic guides from the Ma’alob K’iin association, and Neydi Cardeña, from the department of municipal tourism of Tizimín. We visited several cenotes and caves in an inspiring journey into the wilderness. Remember to take water, comfortable shoes and clothes, like a hat and sunscreen, because the hike lasts for several hours. 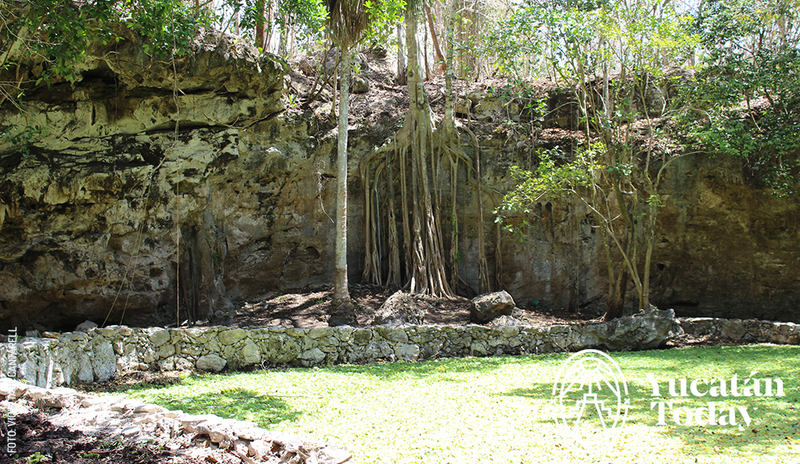 A little less than one kilometer from the main road of San Manuel, we walked in the forest until we arrived at the breathtaking “Kukulkán”cenote, named after the winding rocks which surround the water. While we were enjoying the view, a non-venomous snake slithered up a nearby branch, posing for photographs and, perhaps, giving us permission to be there. Take a photo from above in order to preserve the memory of this beautiful place. You can also descend the rustic stairs, and find small seashells, an amazing experience that helps us remember that we are only 30 kilometers from the coastal gem, El Cuyo. The mystery of the seashells and marine fossils that you find in San Manuel is very intriguing. A possible explication is that the peninsula was submerged in the ocean and emerged a few million years ago. Along the trail of the Maya forest, it’s common to find shells and fossils intact, making this adventure all the more unique. We continued our trip by visiting the “Cueva del León,” (Cave of the Lion), a cavernous cenote that has gone dry. With lamplight, we discovered rocky formations and stalactites, making out figures in each of the formations. The journey continues, and if you’re lucky, you might run across spider monkeys and felines. 30 minutes later, the destination is a huge open-mouthed cenote, ideal for observing a magical, hidden treasure. 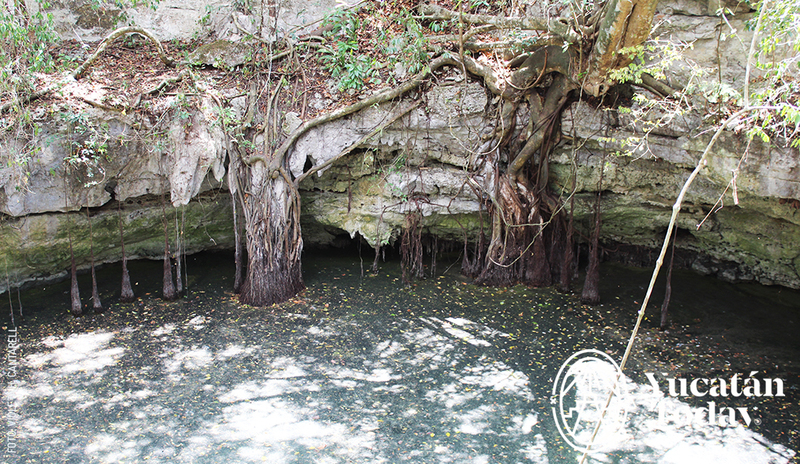 San Manuel has a number of these secrets, with more than 100 cenotes of all kinds registered. You can see a few in a journey of more than six hours like me, or even an entire day, by staying in Tizimín or El Cuyo. Undoubtedly, you’ll have an unforgettable adventure. After your visit to San Manuel, you can continue on to El Cuyo, where you can enjoy the marvelous beaches, with various options for food and lodging. As well, in Tizimín, there are comfortable accommodations, where you can rest and continue the adventure on the following day. Entry fee $150 pesos includes visit to the community museum, town cenote, Cenote Kukulkán and Cenote Juul k’iin.